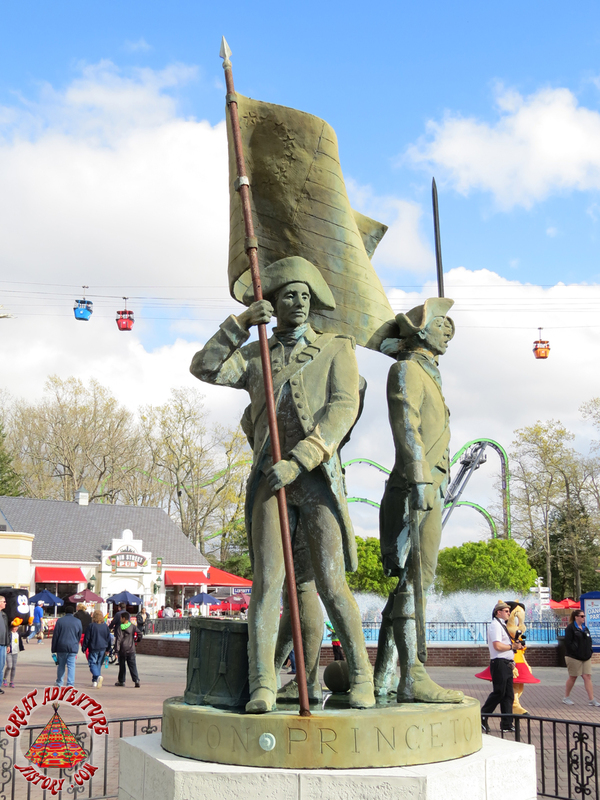 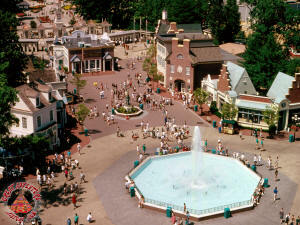 Fountains, statues and other scenic objects are often part of the ambiance of theme parks and amusement parks. 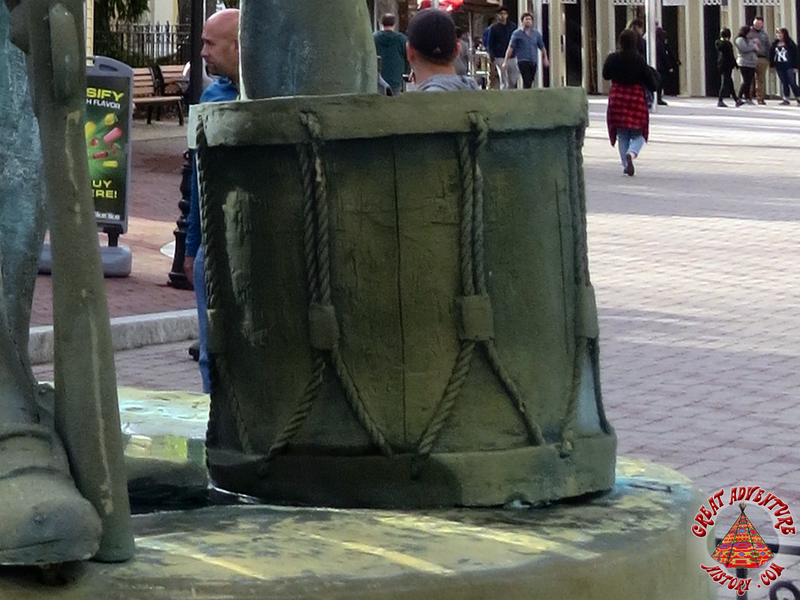 In some cases they are used to enhance natural beauty, as well as to help create an atmosphere and convey a theme of time or place. 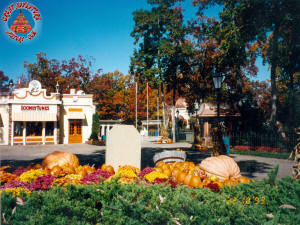 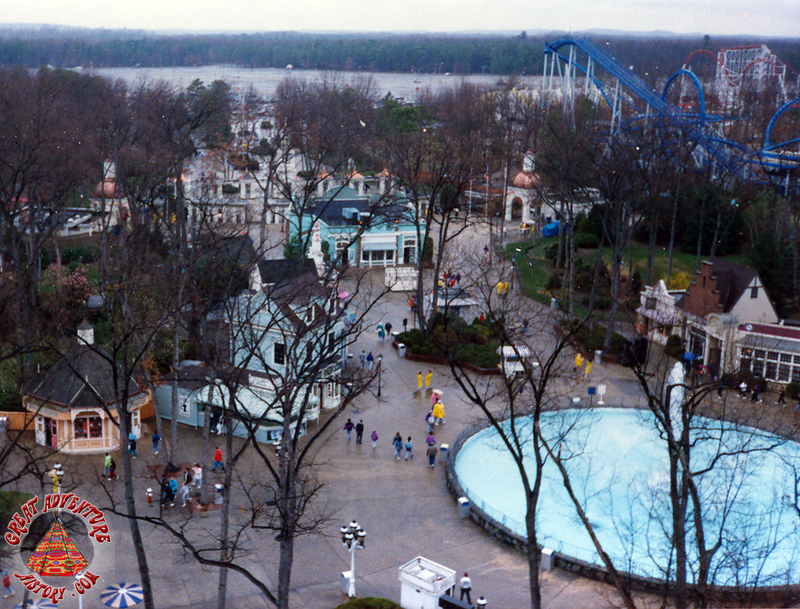 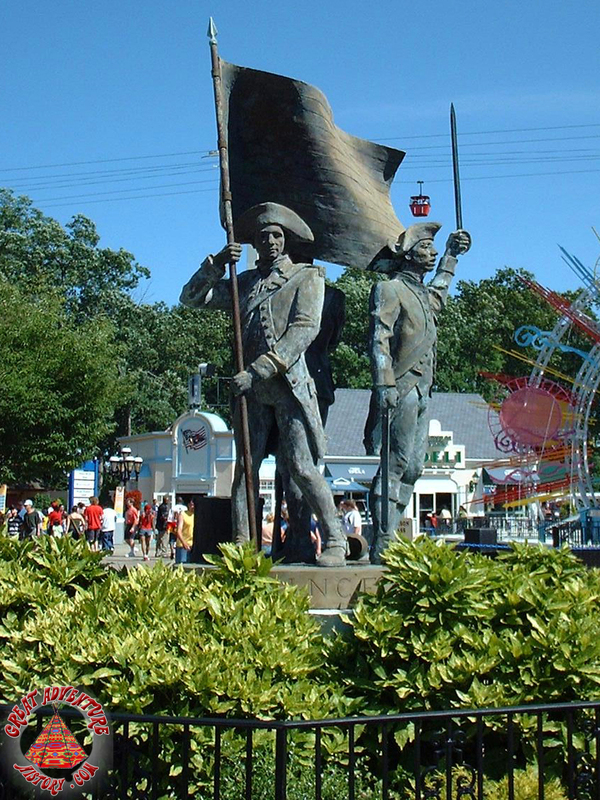 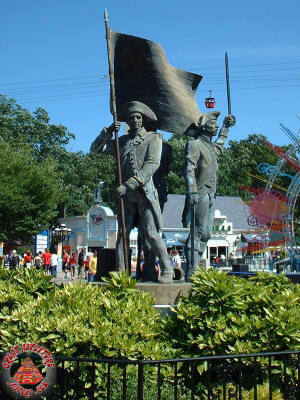 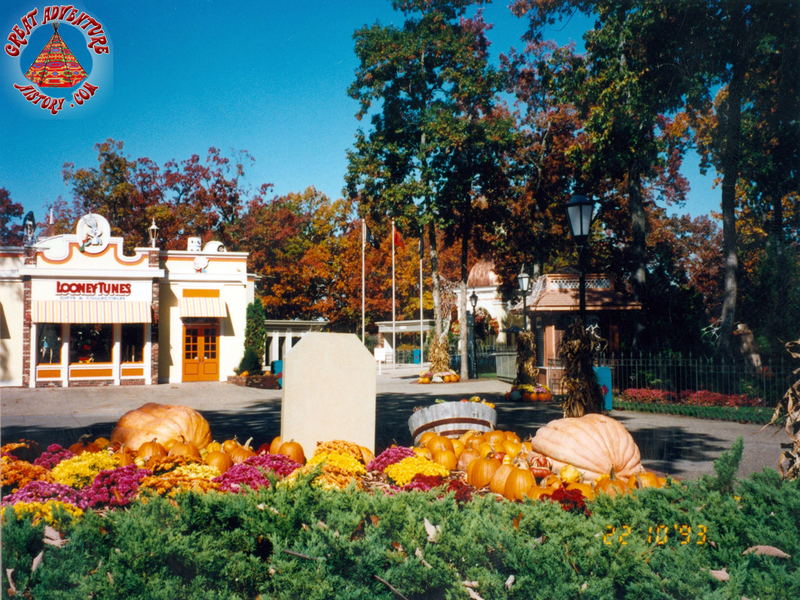 in the 1990's while the Six Flags Theme Park chain was owned by Time Warner, great efforts were taken to create or enhance themed areas in all of their parks. Nowhere was this more evident than at Six Flags Great Adventure where over the years the original theme elements were often lost as new attractions and sections were added. 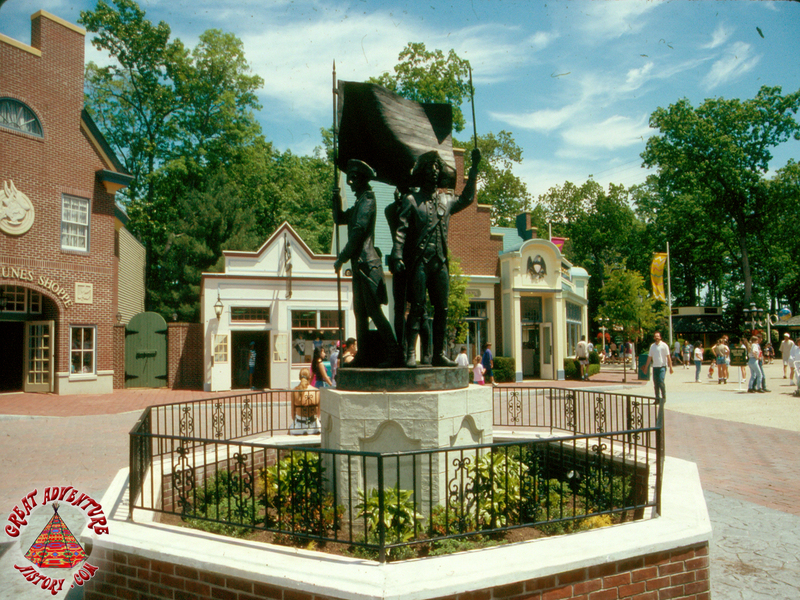 When the park's entrance was relocated to its current location in 1976, a patriotic/colonial themed entrance plaza was constructed, reflecting the wave of patriotism and national pride sweeping the nation as the country celebrated its Bicentennial. 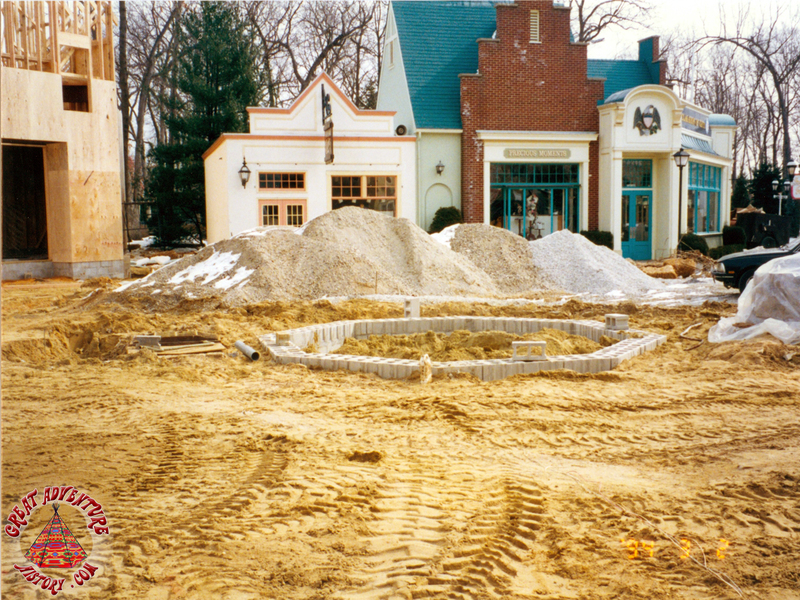 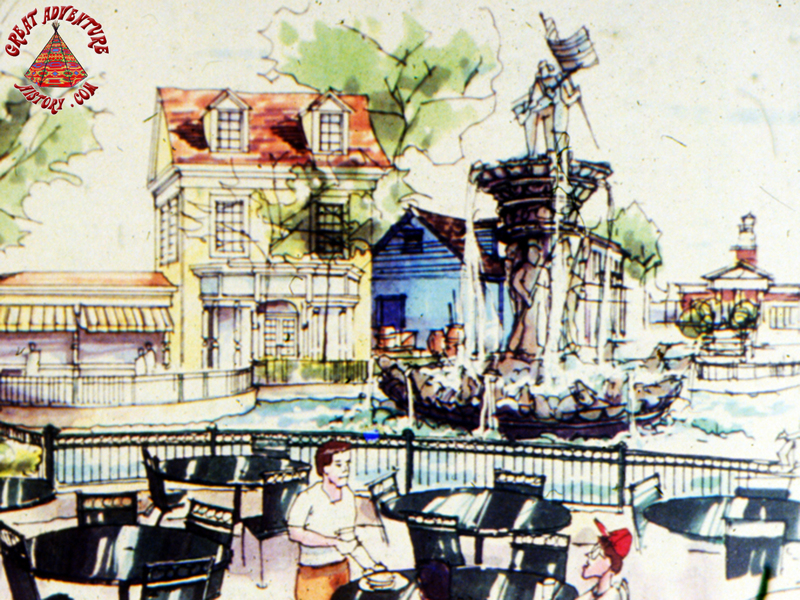 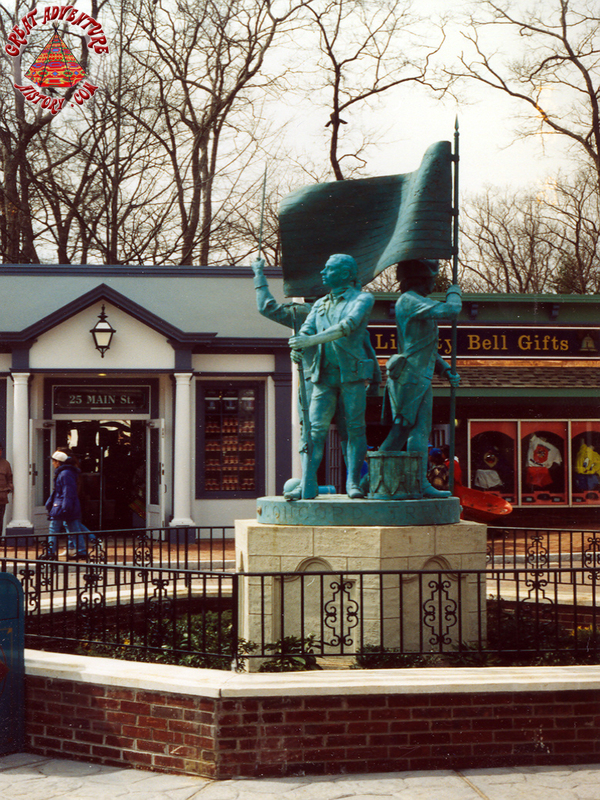 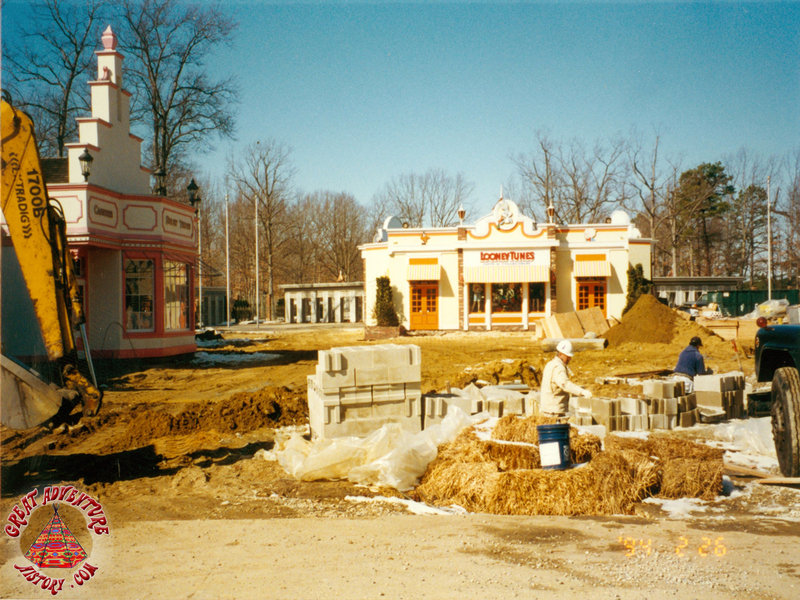 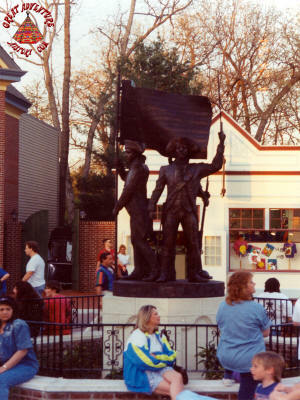 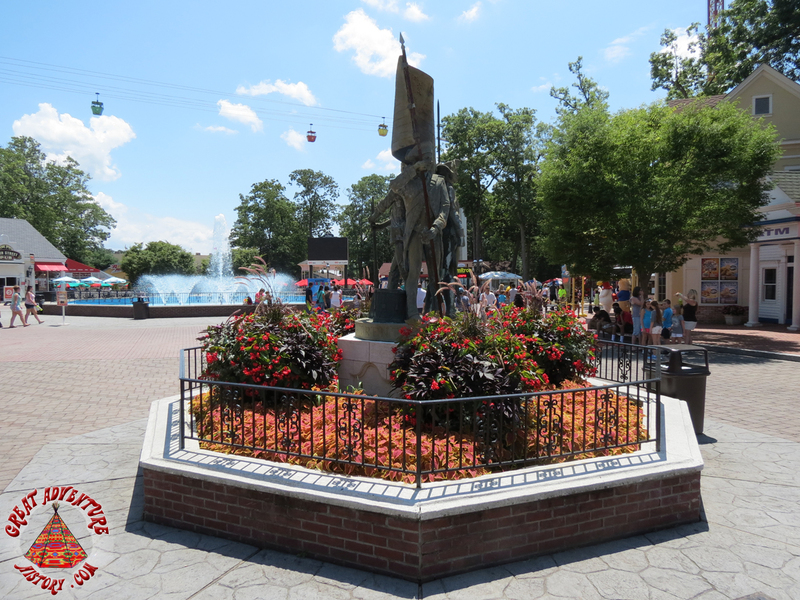 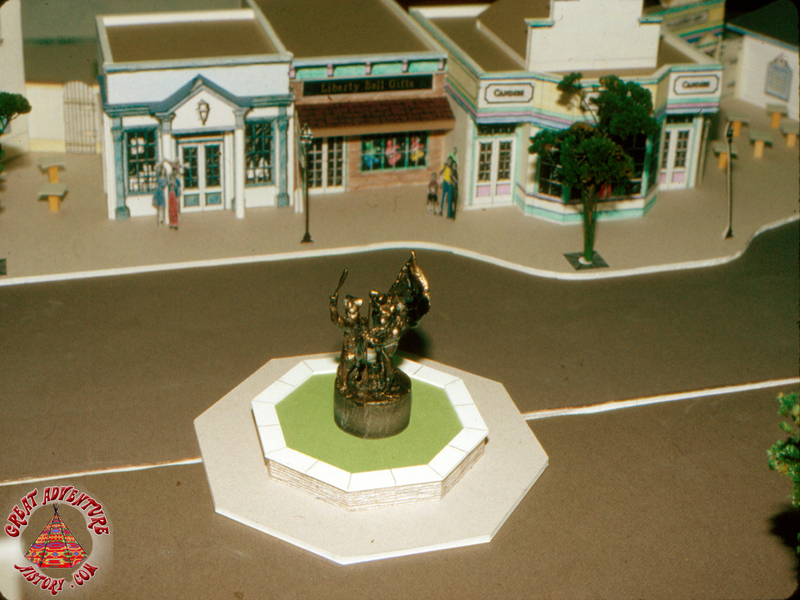 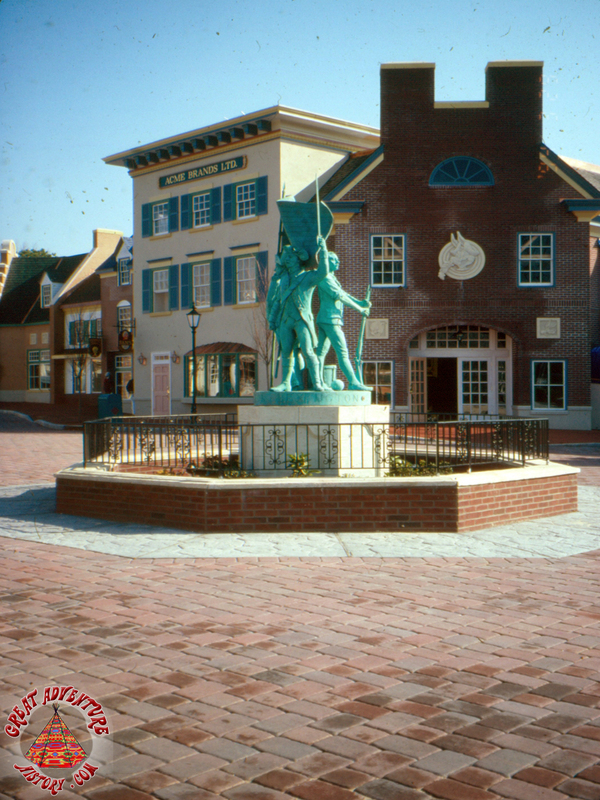 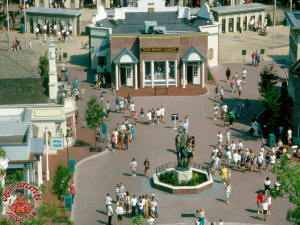 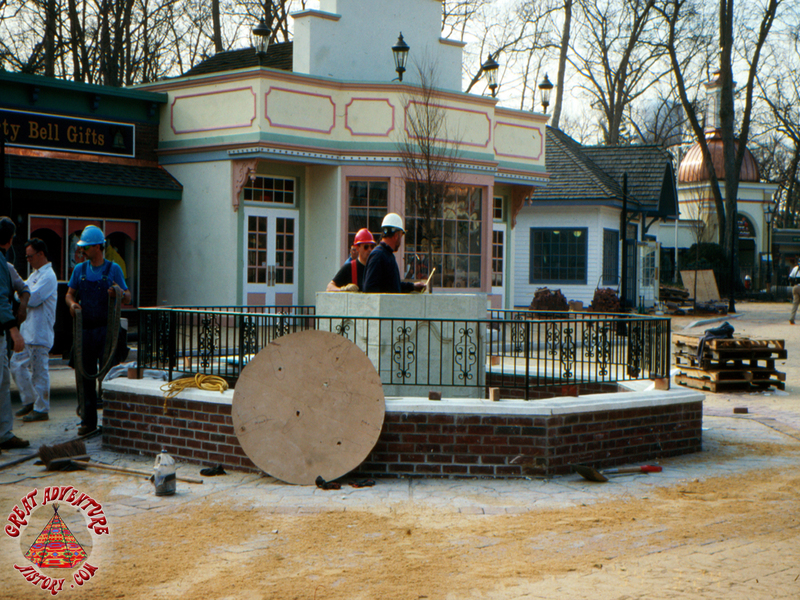 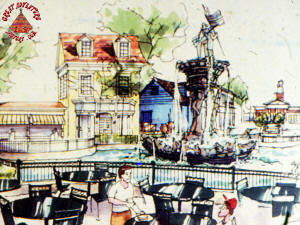 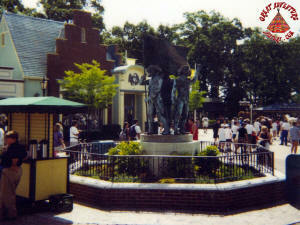 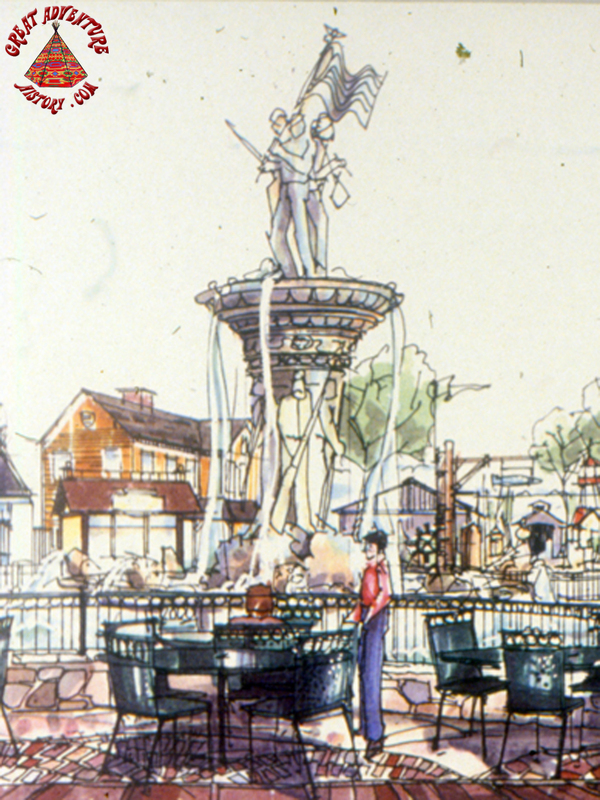 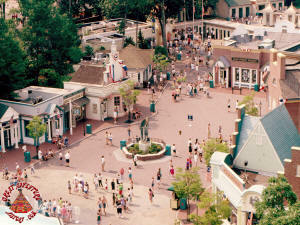 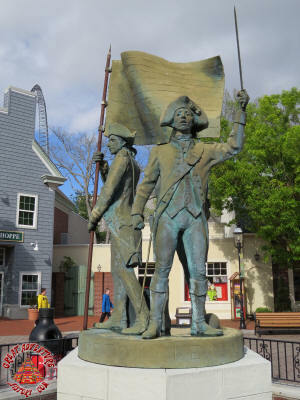 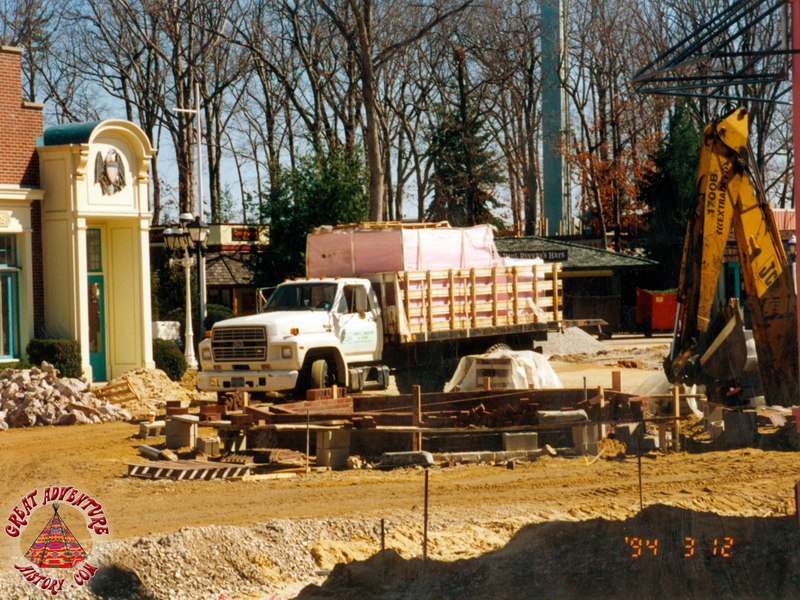 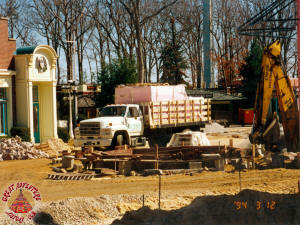 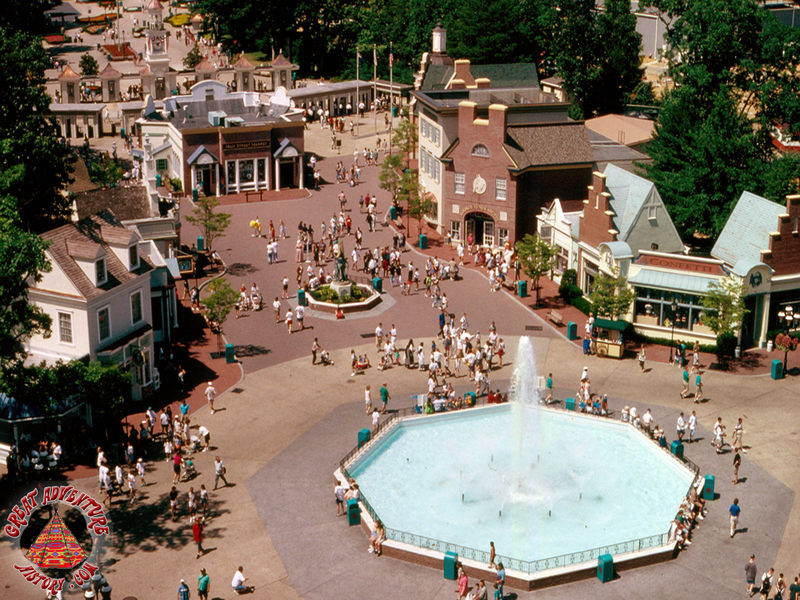 The already colonial themed entry area of the park received a massive facelift in 1994, adding new shops, pavement, and theme elements to create the new Main Street. 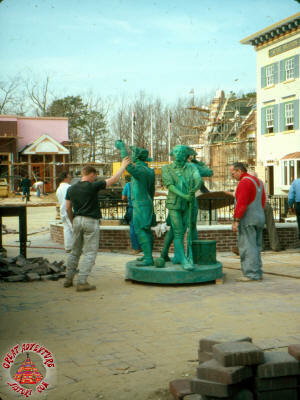 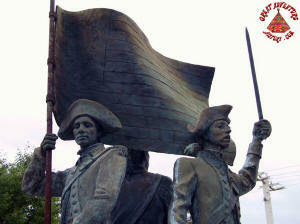 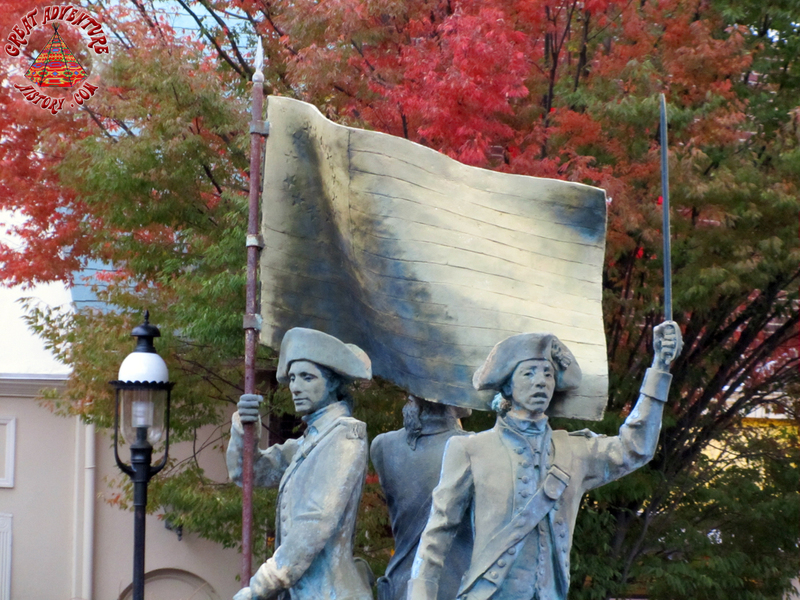 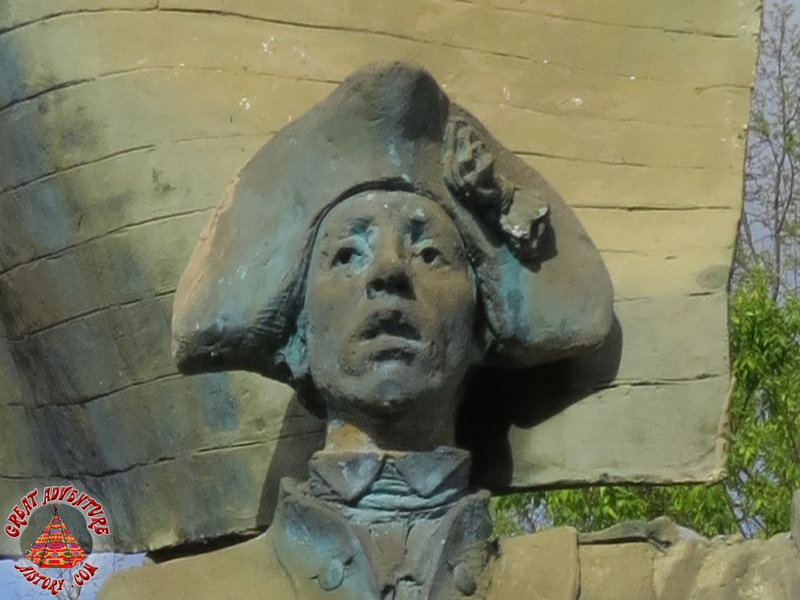 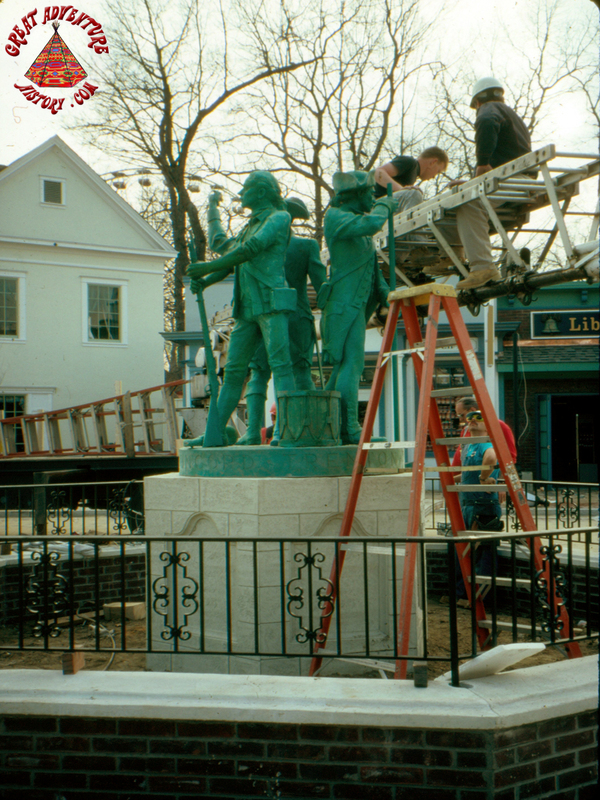 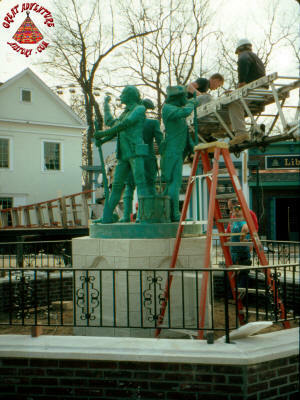 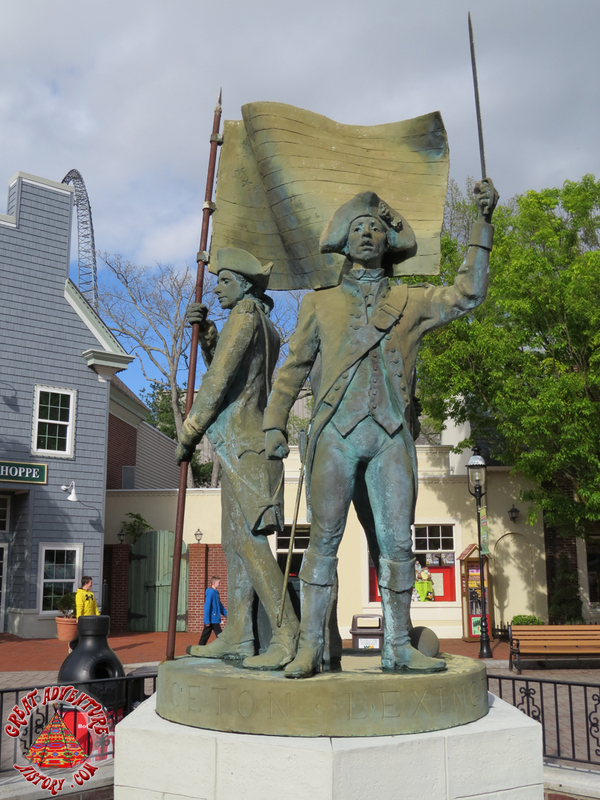 The literal and figurative centerpiece of the makeover was a new statue featuring three colonial era soldiers. 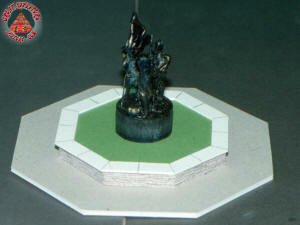 Originally planned as a much more grand statue perched atop a stone pillar in an expanded central fountain, the smaller statue was shorter surrounded by a raised planter for flowers. 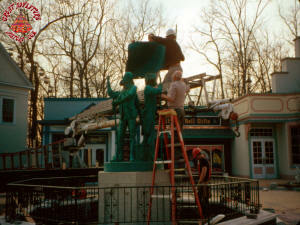 In the spring the statue was installed as the construction of the updated entry plaza neared completion. 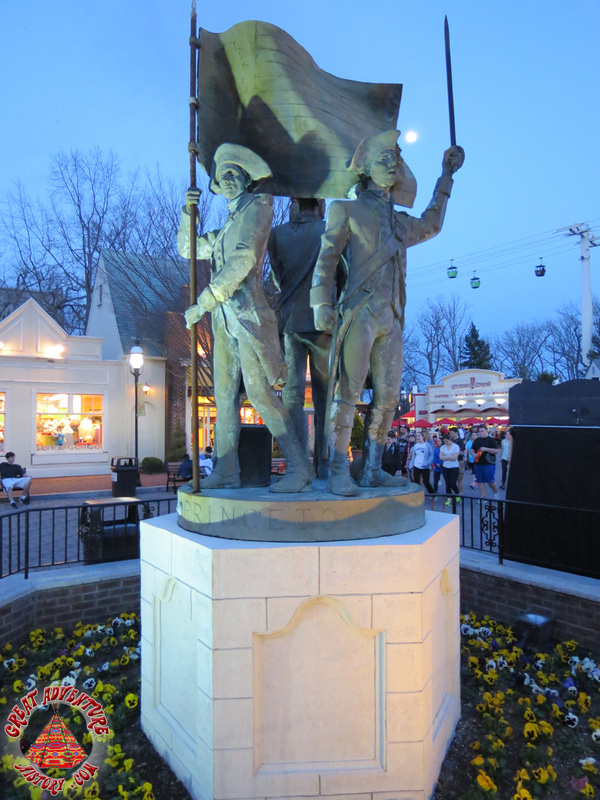 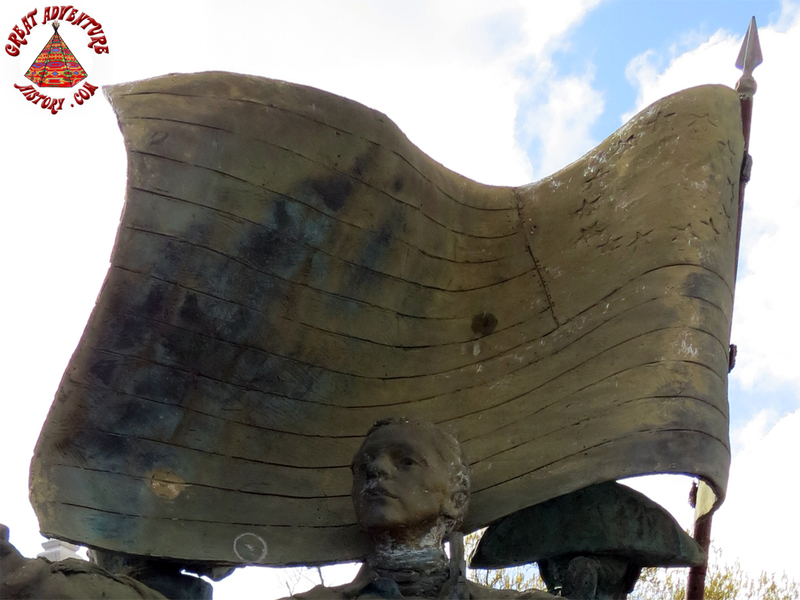 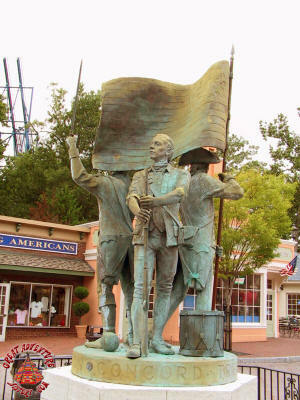 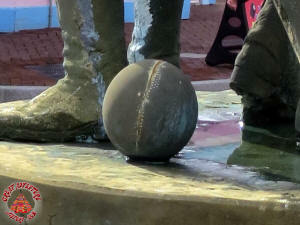 Once the statue was attached to the base, the final piece, a flag was added to give it the finishing patriotic touch. 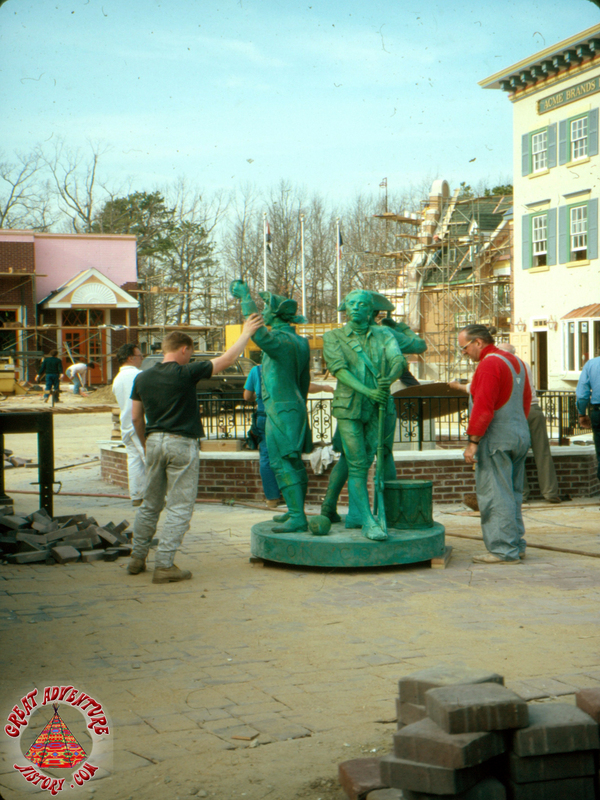 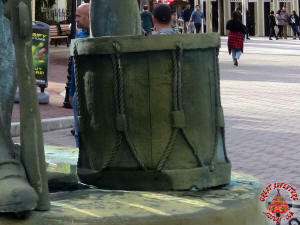 Originally the "bronze" statue had a green patina giving it the look of weathered copper. 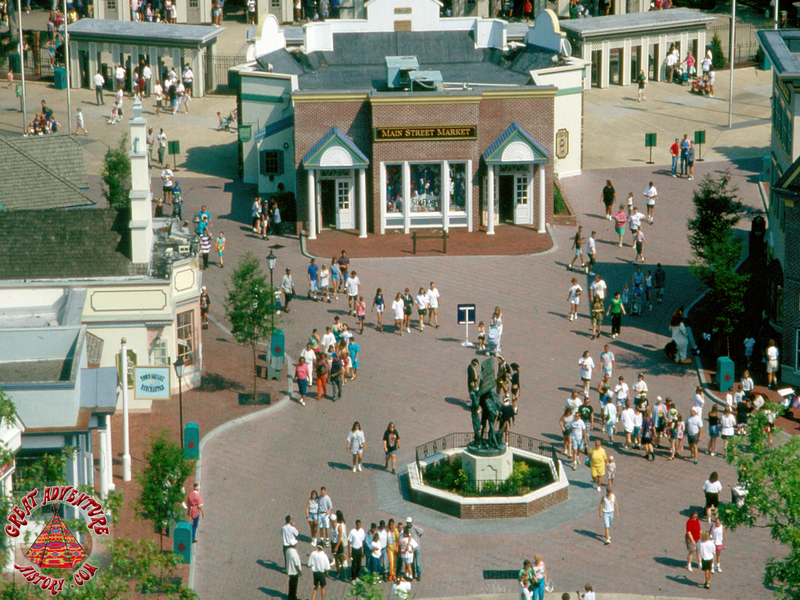 This mirrored the look of the weathered copper roofs of the ticket booths and buildings in the outer part of the entrance plaza. 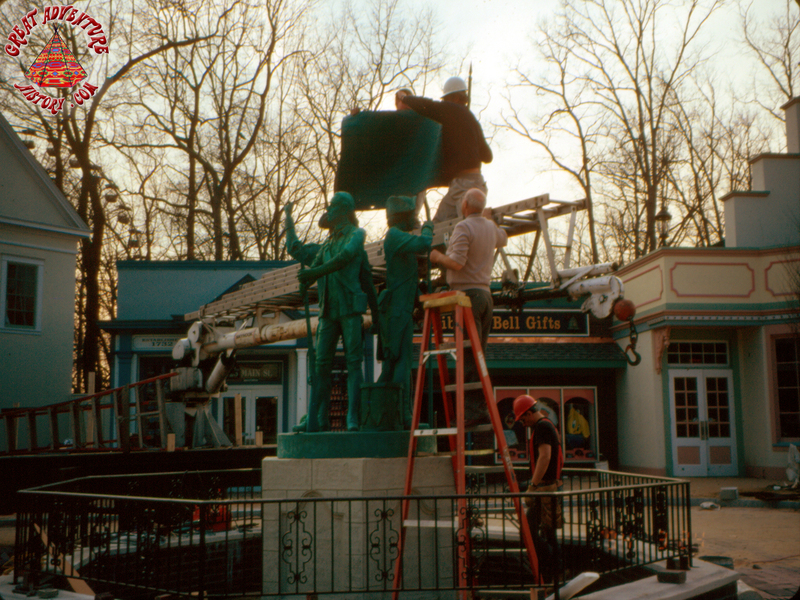 Over time the green faded or was refinished becoming a weathered grey-green appearance and looking very much like an authentic statue from a town square. 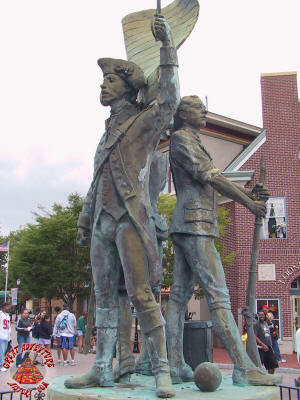 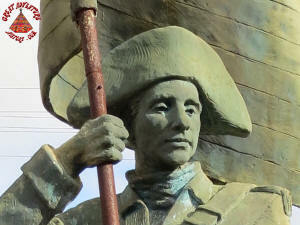 The base of the statue features the names of famous Revolutionary battles including Lexington and Concorde as well as the battles of Trenton and Princeton. 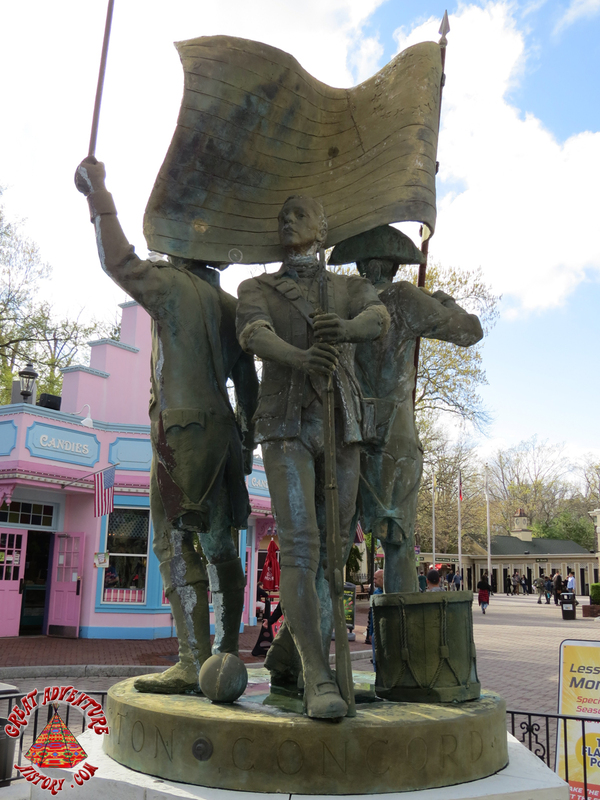 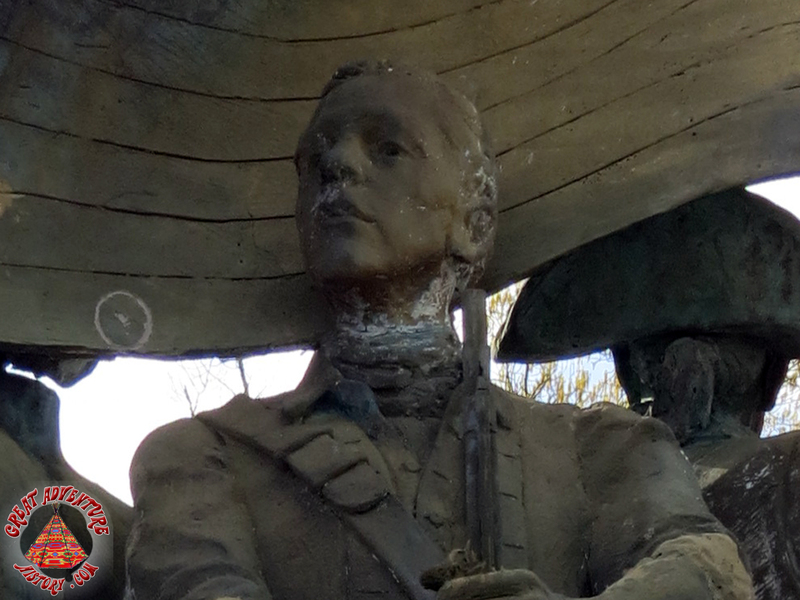 The Minutemen stand guard at the entrance to the park serving as a reminder of New Jersey's history as a crossroads of the fight for American independence.